Be the first to share your favorite memory, photo or story of Phyllis Shirlene. This memorial page is dedicated for family, friends and future generations to celebrate the life of their loved one. Phyllis Shirlene “Punk” Wilmoth died Monday, April 1, 2019 at the age of 83, after a short cancer fight. She was born in Clendenin, the daughter of Eural McCutcheon and Mary Means McCutcheon on January 22, 1936. In addition to her parents, she is preceded in death by her husband, James E. Wilmoth and sister, Sally A. Knotts. She is survived by two daughters, Mary (Becky) Milam, Sanford, FL and Theresa Carmack, Teays Valley, WV. Also surviving are two special nieces, Sheree Knotts, Ripley, WV and Brenda Pollock, Gay, WV, as well as great niece Celeste Knotts. She leaves four grandchildren, 11 great grandchildren and three great great grandchildren. 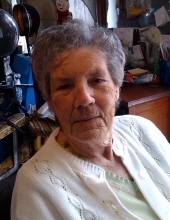 Funeral services will be 12 p.m. Friday, April 5, 2019 at Waybright Funeral Home, Ripley with Mother Marie Mulford officiating. Burial will be at Cunningham Cemetery, St. Albans. Friends may call at the funeral home an hour prior to the service. Online memories and condolences can be sent to the funeral home by visiting www.waybrightfuneralhome.com. To plant a tree in memory of Phyllis Shirlene "Punk" Wilmoth, please visit our Tribute Store. "Email Address" would like to share the life celebration of Phyllis Shirlene "Punk" Wilmoth. Click on the "link" to go to share a favorite memory or leave a condolence message for the family.